The KDC Avara Hood is out! I will be honest, I have no idea why it took me so long to complete this project. I guess getting ill right at the start did slow things down a little. At least I learned a few things along the way that will most likely help for future projects. 6 base styles, 50+ variations. TouchBound locking system, as per usual. RLV Blinding & muffling depending if the active style covers the eyes or the mouth. Auto alpha for system bodies. 5 different shapes including Utilizator’s M3 Venus (slim only at the moment). HUD to customize and store your colors & latex presets. Oh yeah, it has DEMOS, and an extensive user manual, be sure to check them out first!. 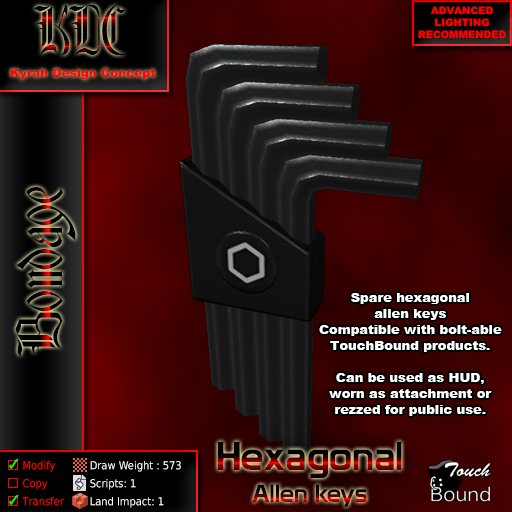 As usual, you can find it at the KDC Main Store in dead realm (feel free to visit!) or the SecondLife Marketplace. The KDC Personal Alarms are now released! Those annoying little alarms are now released, under a “pay what you want” system! It’s all explained on the vendor at the store, but because it’s a little weird and not really compatible with the SecondLife Marketplace (I’m open for suggestions however). There is 4 alarm shapes total, they all have a unique (and annoying) siren, are material enabled and fully tint friendly. I also added a “signal light” feature so you can turn the LED(s) on and off by clicking and holding the mouse down for 3 seconds. Only from the KDC Main Store. The Time-Release padlock is finally released! Now that (al)most of the TouchBound line support this, and after one last hard look at the code to spot any potential bug, I’m proud to release the long overdue time-release padlock! There isn’t a whole lot I can say about it, it isn’t really designed for long-term given that it is capped at 9 hours, it also has a couple of configuration flags, you can read the notecards or check the documentation wiki for details about that. It isn’t that I don’t want to enable people who want “long play” timers, but I believe that it is gonna require a dedicated lock, with a proper key bypass. The lined chrome chastity belt, lattice cage, piercings and isolation headphones do not support time padlocks yet, for all the other items, please double check that you have the latest update! 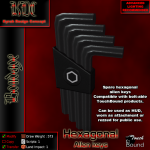 As usual, you can get it at the KDC Main Store or from the SecondLife Marketplace. Enjoy! The KDC Fallen Princess Collar is out! One evening we found this beautiful young lady sheltering from the rain under an awning behind the KDC facility. She told us that she was a noble from another realm who was on the run after her father had been overthrown. She sounded a little crazy but after our blacksmith managed to free her from what looked like a heavy slave collar, we gave her food and shelter for the night. The next morning we considered calling the police but she had vanished! All that was left was this collar to remind us that we did not dream any of this. Yes it’s finally out, But I strong recommend checking the manual for the little quirks this design features. As usual, you can pick it up from the KDC Main Store or from the SecondLife Marketplace. The KDC Shigeko ballet boots are out! I’m so sorry for the silence of the past few days but I crammed an ungodly amount of work in very little time and I was too tired to post more progress reports. They are unrigged, making them suitable for pretty much any avatar, mesh or non-mesh body, enjoy! As usual, you can pick them up in-world from the KDC Main Store or from the SecondLife Marketplace. The KDC Vermilion thigh cuffs are out! And the Vermilion set is now complete! Hurray! I’ve used the same strap width as for the collar, wider cuffs would have looked weird where the leg tapers. The straps are anatomically shaped and “should” fit most normal legs (It’s a “one size fits most” kind of shape) without too much trouble. It also comes with the Universal Vermilion Coloring HUD, which can color the entire set simultaneously. As usual, you can grab them from the KDC Main Store or from the SecondLife Marketplace. The KDC Vermilion collar is out! The most important part of the Vermilion set is now available! Same design as the matching cuffs, but a bit narrower (it is a collar after all), it comes in all the standard KDC colors and also in the “Vermilion” dark red. The Vermilion cuffs are out! This time it is an elegant Japanese-inspired leather design reminiscent of the lined chrome set, available in wrist, ankle and elbow version!